Contrary to a popular misconception, the rate of warming has not declined. Global temperature is rising as fast in the past decade as in the prior two decades, despite year-to-year fluctuations associated with the El Nino-La Nina cycle of tropical ocean temperature. 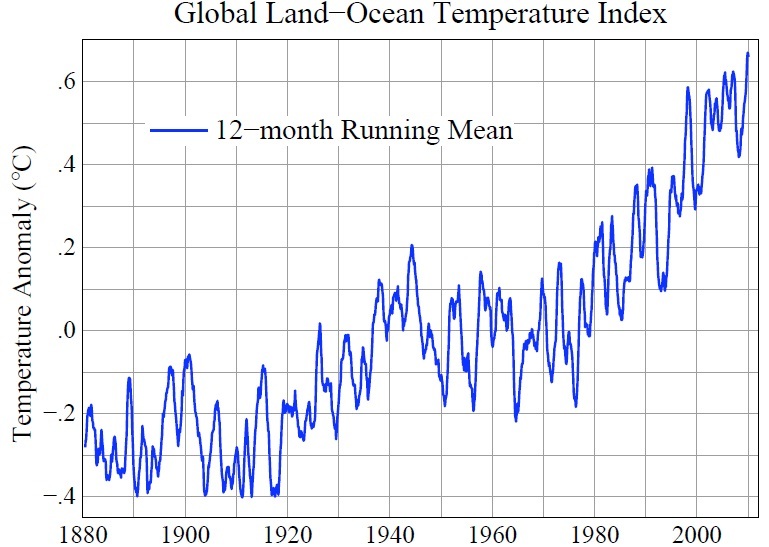 Record high global 12-month running-mean temperature for the period with instrumental data was reached in 2010. 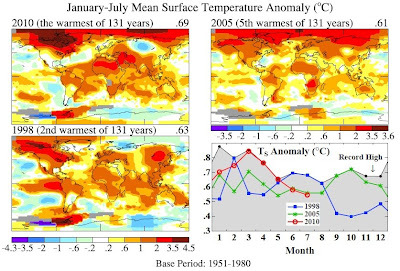 The July 2010 global map of surface temperature anomalies (Figure 1), relative to the average July in the 1951-1980 period of climatology, provides a useful picture of current climate. It was more than 5°C (about 10°F) warmer than climatology in the eastern European region including Moscow. There was an area in eastern Asia that was similarly unusually hot. The eastern part of the United States was unusually warm, although not to the degree of the hot spots in Eurasia. There were also substantial areas cooler than climatology, including a region in central Asia and the southern part of South America. The emerging La Nina is now moderately strong, as evidenced by the region cooler than climatology along the equator in the eastern and central Pacific Ocean. The global average July 2010 temperature was 0.55°C warmer than climatology in the GISS analysis, which puts 2010 in practically a three way tie for third warmest July. July 1998 was the warmest in the GISS analysis, at 0.68°C. 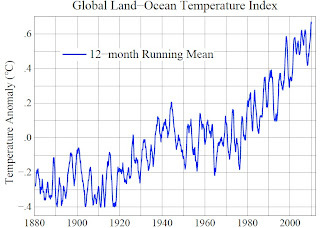 The 12-month running mean of global temperature (Figure 2) achieved a record high level during the past few months. Because the current La Nina will continue at least several months, and likely strengthen somewhat, the 12-month running mean temperature is expected to decline during the second half of 2010. Will calendar year 2010 be the warmest in the period of instrumental data? 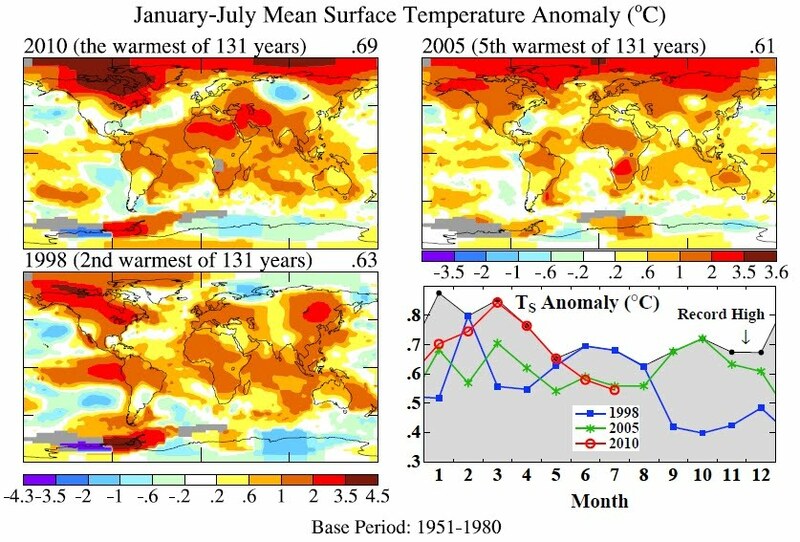 Figure 3 shows that through the first seven months 2010 is warmer than prior warm years. The difference of +0.08°C compared with 2005, the prior warmest year, is large enough that 2010 is likely, but not certain, to be the warmest year in the GISS record. However, because of the cooling effect of La Nina in the remainder of the year, there is a strong possibility that the 2005 and 2010 global temperatures will be sufficiently close that they will be practically indistinguishable. Climate anomalies in the Northern Hemisphere summer of 2010, including the heat in Eastern Europe and unusually heavy rainfall and floods in several regions, have received much attention. Are these climate anomalies an example of what we can expect global warming to look like? Maps of temperature anomalies, such as Figure 1, are useful for helping people understand the role of global warming in extreme events. The location of extreme events in any particular month depends on specific weather patterns, which are unpredictable except on short time scales. The weather patterns next summer will be different than this year. 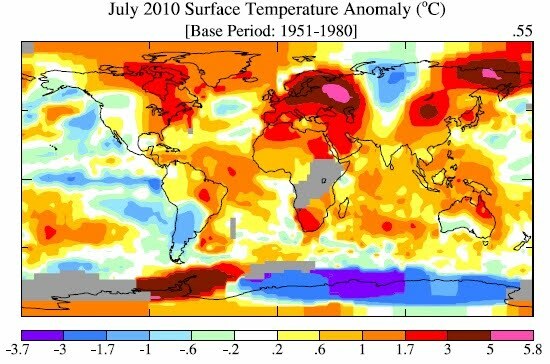 It could be a cooler than average summer in Moscow in 2011. But note in Figure 1, and similar maps for other months, that the area warmer than climatology already (with global warming of 0.55°C relative to 1951-1980) is noticeably larger than the area cooler than climatology. Also the magnitude of warm anomalies now usually exceeds the magnitude of cool anomalies. The paper describing the GISS analysis of global temperature has been revised in response to reviewer suggestions and submitted to Reviews of Geophysics. The biggest change in the paper is inclusion of an additional analysis is which global temperature change is based only on stations located in "pitch dark" regions, i.e., regions with satellite-observed brightness below the satellite’s detection limit (1 μW/m2/sr/μm). Our standard analysis uses stations with satellite-observed brightness below 32 μW/m2/sr/μm. This more strict brightness limitation has no significant effect on analyzed global temperature change, providing additional confirmation that any urban effect on the GISS analysis of global temperature change is small.